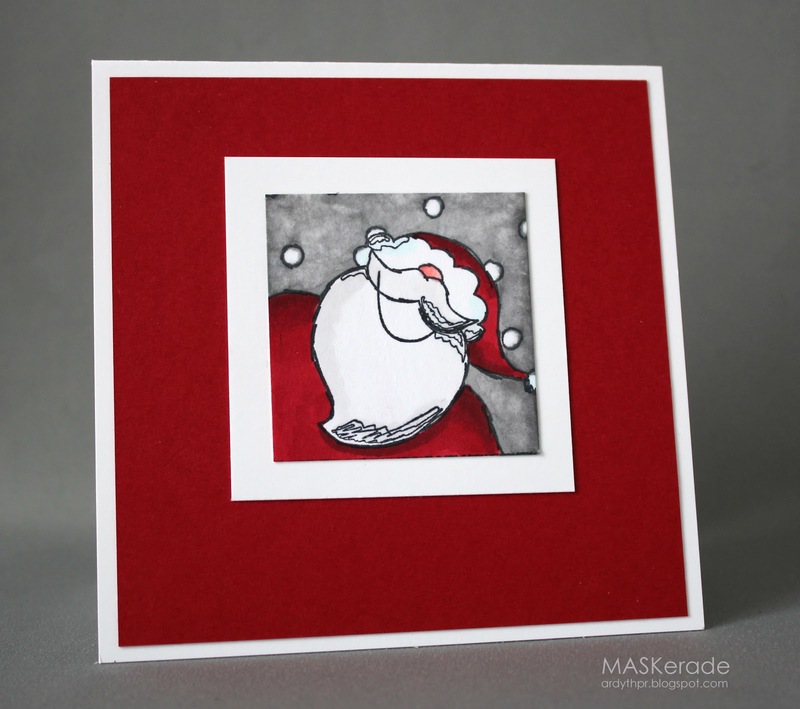 I used a Santa stamp from Stamps Happen. Not sure about this guy. It's a bit hard to tell what you're looking at! The interesting thing (to me), is the effect on the sky. I coloured it using grey Stampin' Up Blendabilities markers and then went over it with a lighter grey Copic and got this really mottled look, which I like, but I was pretty surprised that they didn't blend together. Aren't they both alcohol ink? I think he's kinda cute Ardyth! Wouldn't mind getting this stamp myself! He's an artsy Santa in a CAS card! Superb! GREAT card Darnell!! Your surprise turnout of the sky looks terrific!! He's so cute. But you're right, it could be my Dad and I wouldn't recognise him. Super cute card, Ardyth!!! Love the look of the sky! I love the effect on the BG! That sky looks very cool. Love your card. This turned out so cute. I just bought the blendabilities markers and can't wait to use them! It might be just me, but Ardyth, I would just say "look at that sky - isn't it fab?" 'cuz it is! So is this Santa!! Darling card..
a great card for both challenges Ardyth! I'd say his furry trimmed hat is pulled down over his eyes AND that he's looking up??!! cute regardless! maybe the pens didn't blend because of the paper you were using? I know they always talk about which papers are best to use with Copics.. and that some don't work well - ??? Adorable Santa image & you've colored it perfectly!! Wow! I love this Santa and all the red! Did I say that I liked all that red? Thanks for sharing this with us at Merry Monday! Nice surprise with the markers - I love the effect! You may have just stumbled upon a new technique! I love this quirky Santa! At the least, we know he has a nose! Awesome border/frames! This is one fabulous Santa...just so fabulous. Love it! Oh he definitely looks like Santa to me and I love the look you got from the blendabilities and Copic markers...it really makes all the red "pop"! Great card Ardyth! Stunning, I love your CAS design and your Santa is fabulous. 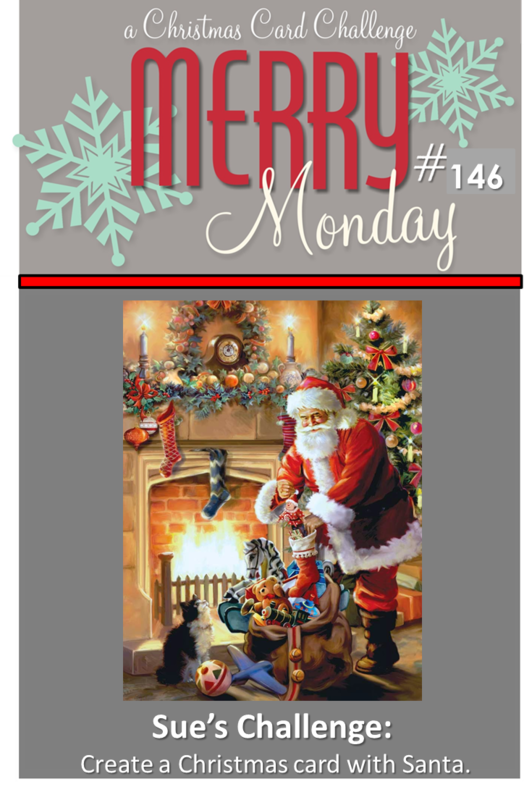 Thanks for joining my Santa challenge at Merry Monday. Perfect. 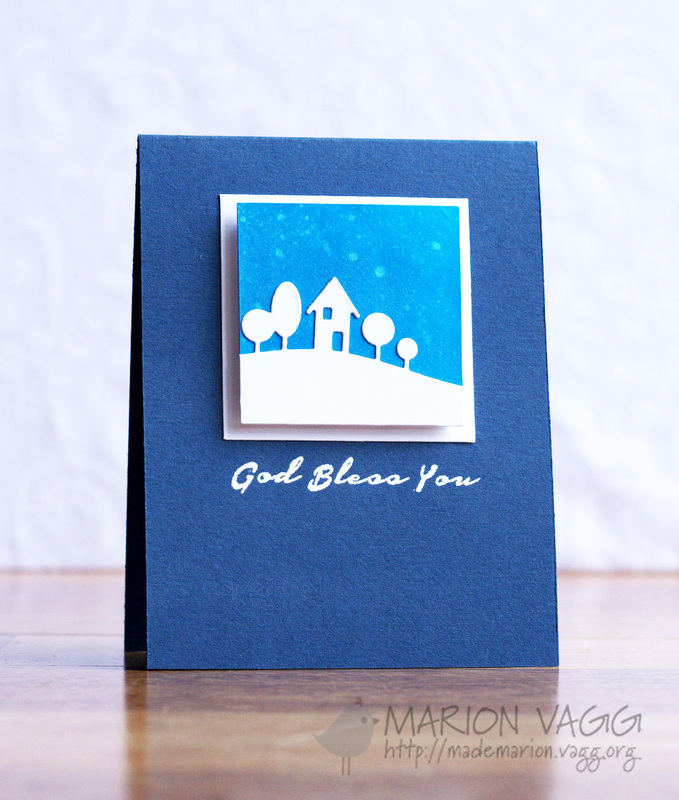 Love the simplicity and festive colors. Winner, winner. 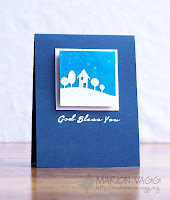 A fab card and I love the Santa stamp. I love this image and the fact you've framed him so boldly makes him really stand out! Thanks so much for joining us at Merry Monday. I think it's a fun Santa image - who doesn't want to see what's going on up Santa's nose?? LOL! Seriously though love the red and white frames and that mottled sky is very cool. So AMAZING!!! Loved this. Cant wait to see you guest Ardyth!! Amazing and artsy Santa ! Love!